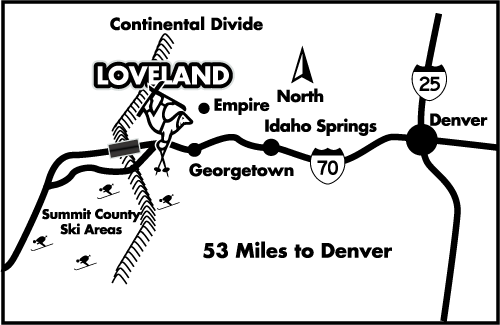 With over 75 years of history, 200+ days of skiing and riding each season, tons of events and unique products and programs, Loveland Ski Area has lots of stories to share. See below for a short list, but please CONTACT US for details or additional ideas. When the temperatures begin to drop in the high country, Loveland Ski Area is getting ready to make snow. Loveland typically starts snowmaking operations the last week of September in preparation for the upcoming season. When snowmaking begins, the season isn’t far off! Loveland’s elevation and experienced snowmaking crew allow Loveland to compete to be the first ski area to open for the season in the annual Race to Open. Loveland Ski Area has been the first ski area in the nation to open for the season in eight of the past thirteen seasons. Loveland Ski Area is known for having exceptional early season conditions. Loveland will always open with at least one top-to-bottom run of 1,000 vertical feet and nearly a mile in length covered from tree to tree with an 18” base. Opening Day is always an exciting event as skiers and riders come up to celebrate the first turns of the season. Skiers and snowboarders can now enjoy free snowcat rides to some of Loveland’s most exhilarating terrain on Loveland’s Ridge Cat. This 20 passenger snowcat will provide access to Field of Dreams, Velvet Hammer, Tickler, Marmot and Golden Bear when conditions permit. Click Here for more information. Every year couples flock to Loveland Ski Area on Valentine’s Day to take the plunge or renew their vows in a mass wedding ceremony at the top of Chair 2 at an elevation of 12,050”. The event typically draws between 60 & 80 couples, some of which attend in full wedding attire. After the ceremony, the newlyweds ski or snowboard down the mountain to the reception that features wedding cake, a cider toast and a best dressed contest. It is quite a site to watch the couples make turns down the mountain in wedding dresses and tuxedos! You’ve heard the saying “If at first you don’t succeed, try, try again.” There is a reason you’re supposed to try three times – 3 is the magic number! Loveland Ski & Ride School is so convinced that it rewards beginner skiers and snowboarders with a free season pass when they complete three full lesson packages, starting with a newcomer lesson package. All children 6-14 that complete three lesson packages also receive a free season pass. Loveland Valley is also the ideal place for beginners to develop their lifelong love of snow sports. This separate area offers beginners their own lifts and gentle slopes perfect for getting to the next level. 3 Class Pass products are also available for intermediate and advanced skiers with some restrictions. Loveland Ski Area is the place for Front Range skiers and riders to try the newest gear before they buy it. Each season Loveland hosts a giant early season demo day with Christy Sports. This large demo allow skiers and snowboarders to try the latest and greatest gear from all the leading brands. Loveland also hosts dozens of smaller demos with local shops and boutique brands. Visit our event calendar for dates and details. And every day is a demo day in the Loveland Sport Shop where skiers and riders can take advantage of the Hat Trick Demo Package to make sure they find the perfect gear for their needs. Loveland Ski Area offers Colorado’s only flexible 4 hour ticket. The Flex Ticket allows skiers and snowboarders to ski any 4 consecutive hours they choose at the half-day rate. No more waiting for the half-day rate to start, so guests can arrive early and leave early. Guests pay full price at the time of purchase and then receive a partial refund if the ticket is returned within 4 hours of purchase. Flex tickets are available during the regular season only and must be requested at the time of purchase. Loveland’s Daytripper Package includes everything you need for a great day on the slopes. A lift ticket, ski or snowboard rental and clothing rental(goggles, gloves, jacket and pants) are included and packages start at just $109 – less than a lift ticket at most Colorado resorts! Loveland’s event calendar is full of exciting events including Mountaintop Matrimony, dozens of demo days, the New Belgium Scavenger Hunt and Corn Harvest benefit for The Colorado Avalanche Information Center.